Do You Know How Banderas Bay Got Its Name? Did You Know That Playa de Los Muertos is the Liveliest Beach in Puerto Vallarta? Puerto Vallarta offers a wide variety of entertainment options, such as swimming with dolphins, ATV tours or an exciting fishing trip, but one activity that you shouldn’t miss during your beach vacation in Puerto Vallarta is a stroll along the beautiful boardwalk. A fun and relaxing stroll along the boardwalk in Puerto Vallarta, whether in the morning, afternoon or evening, is an experience to remember. Take note of the following attractions the next time you visit the boardwalk in Puerto Vallarta. 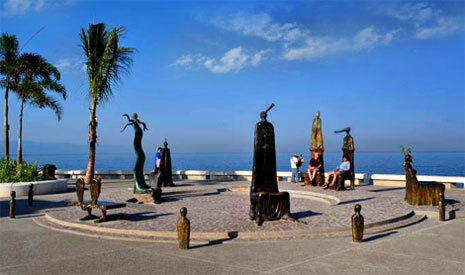 * The boardwalk in Puerto Vallarta is an outdoor sculpture museum. You can begin your tour at Los Arcos (The Arches), one of the icons of Puerto Vallarta. Stop to appreciate La Fuente de la Amistad (The Friendship Fountain), which is represented by three dolphins, before continuing along the boardwalk until you reach the sculpture of Neptune and Nereid. * Behold beautiful ocean views and admire the stunning contrast of the sea and the undulating terrain of the Sierra Madre Occidental Mountains. * In the middle of the boardwalk, you’ll find La Rotonda del Mar (The Rotunda of the Sea), a series of sculptures of humans in the form of chairs, where you can relax under the shade of a palm tree and enjoy some ice cream or a refreshing beverage. * With several stores selling regional crafts and souvenirs, you can easily take advantage of this stroll along the boardwalk to go shopping in Puerto Vallarta. In addition to local items, you’ll also find jewelry stores and art galleries with paintings and sculptures by diverse artists. * To wrap up your tour, there’s nothing better than enjoying a delicious meal at one of the restaurants in Puerto Vallarta, many of which can be found along the lovely boardwalk. There are restaurants serving international favorites, and of course, lots of traditional Mexican cuisine.